Colonial Wargaming: Hills and Mountains – Does Heroscape hex terrain provide a possible answer? Hills and Mountains – Does Heroscape hex terrain provide a possible answer? 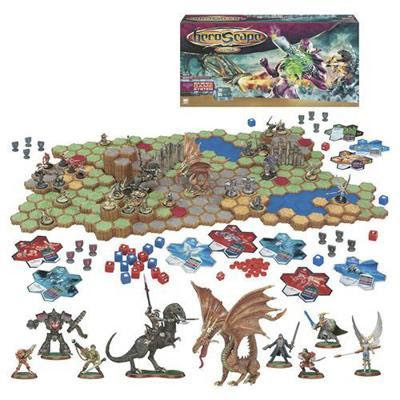 Heroscape is a fantasy figure game that was originally marketed by Milton Bradley, but is now owned by Hasbro. The original Master Set contained a set of pre-painted, plastic 28mm miniatures, rules, special dice, game markers, and a hex terrain system that clipped together to for the terrain over which the fantasy battles were fought. Some time ago I looked at the possibility of using the Heroscape hex terrain for ‘normal’ wargaming; however the price of a Master Set put me off until I discovered that Argos were selling off their stock of Master Sets at considerably lower prices. I bought quite a few sets … and then wondered what to do with them. The figures were easily disposed of to people who wanted them for their Heroscape games, and I was soon left with just a large collection of hexed terrain. I then discovered the Melee Wizards Terrain website, which had several tutorials on how to customise Heroscape hex terrain with paint and flock. I followed the basic methods that were outlined, and soon had some green painted and flocked hexes that I was able to use for a colonial game. The draft rules that I used are on my website here. When I recently began thinking about creating hills and mountains for future colonial wargames, the Heroscape hex terrain – of which I still have a considerable amount unpainted and unflocked – sprang to mind. It can be clipped together quickly and easily, is easy to store, troops can stand on it, hills and mountains can be ‘built’ to suit a particular scenario, and the sides of the hexes look ‘rugged’ because of the system that is used to hold the hexes together. The hexes are basically brown with different colours (green, grey [rocks], and tan [sand]) painted on the top, and different combinations (one hex, two hexes, three hexes, and seven hexes). The ones shown in the following examples are tan. … and a large hill/small mountain. N.B. The figure shown in these images is a 15mm British Colonial Infantryman made by Essex Miniatures. It gives some idea how large the hexes are when placed on top of each other. By painting and flocking these terrain hexes, I could create suitable hills and mountains for all my games. They don’t look as good as the profile hills and mountains … but they are easier to store and can be taken apart and rebuilt into new shapes and sizes as required. Troops can stand on them, and pathways up, down and through them can be created. Not a perfect solution but certainly a possible one. How large is each of the hexes from side-to-side? The hexes are quite small (they are designed to fit one 25/28mm figures) and are approximately 40mm (1.75 inches) face-to-face and 50mm (2 inches) point-to-point. You are absolutely right, it would need a lot. However I bought at least 10 sets, and that gives a lot to play around with. I know that the Master Sets do turn up on ebay and jumble/boot sales (what I think are called garage sales in the US) and that might be a way of getting quite a lot of the hexes quite cheaply. The website is dead ... long live the blog!